On the evening of February 6th a report headlined “US to buy Israeli Iron Dome missile defence system” was published on the BBC News website’s ‘US & Canada’ and ‘Middle East’ pages. Overall the report’s text gives an accurate account of the story. “The US military has announced plans to buy and test out Israel’s Iron Dome missile defence system. The report includes a photograph which was originally captioned “Iron Dome anti-missile system fires an interceptor missile as rockets are launched from Gaza towards Israel near the southern city of Sderot, Israel August 9, 2018”. “The system, which took billions of dollars to develop, has faced criticism for its cost”. Criticism from whom? Is that criticism relevant or justified? What is the cost of the system? Is its cost made effective by savings elsewhere? The BBC of course did not bother to answer any of those questions. 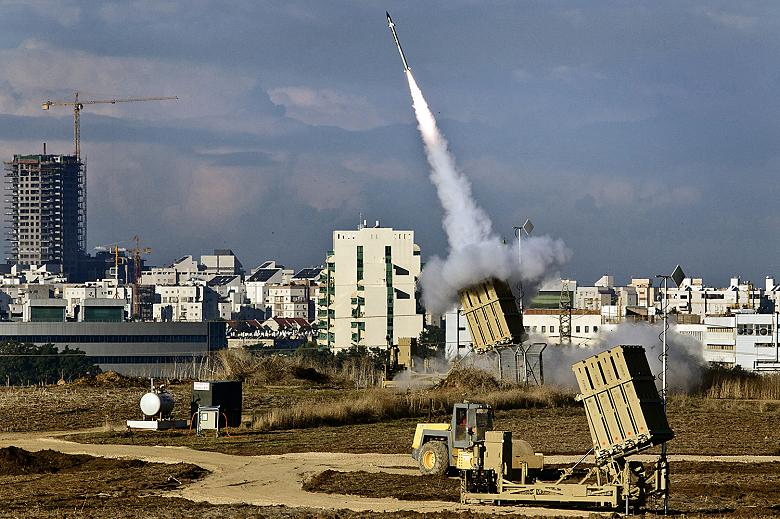 In 2015 missile defence expert Uzi Rubin published a paper comparing three conflicts: the 2006 Second Lebanon War – during which Israel did not yet have the Iron Dome – and Operations Pillar of Defence in 2012 and Protective Edge in 2014. With the number of rockets fired in each of those conflicts on record, he was able to calculate the relative lethality of rockets before and after deployment of the defence system. In addition, Rubin examined the number of claims for government compensation following property damage during those three conflicts. According to local reports, one Iron Dome interceptor missile costs $50,000, and the estimated price of one battery, including its command and control system, is $50 million. 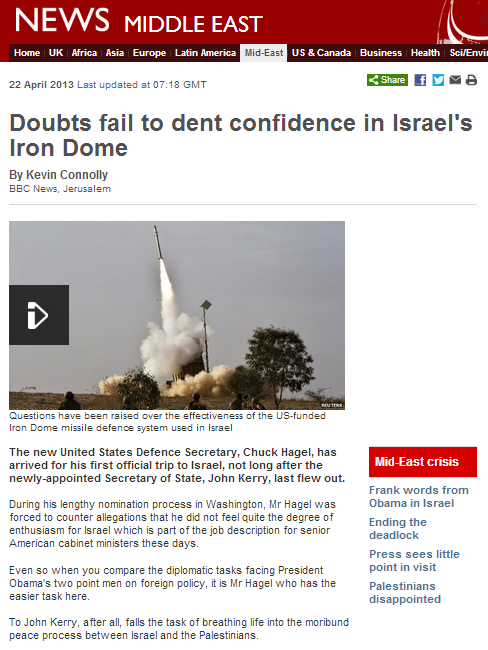 BBC audiences are of course no strangers to bizarre BBC criticism of the Iron Dome system. While this latest report offers readers ‘related reading’ from November 2012 in the form of a profile of the system and an article by diplomatic correspondent Jonathan Marcus, the following year the corporation published at least three reports questioning the system’s effectiveness before changing its tune again in 2017. On October 30th the BBC News website reported the story of the controlled detonation by Israel of a Palestinian Islamic Jihad tunnel running from the Gaza Strip into Israel. Since then, however, audiences have seen no follow-up reporting on what is still an ongoing story – despite BBC journalists in the region being aware of developments. On November 5th Israel announced that it had found the bodies of five PIJ operatives inside the tunnel. On November 11th Israel put out a warning to the PIJ. “In an Arabic video message, an Israeli general on Saturday publicly warned the Palestinian Islamic Jihad to abandon plans to carry out a retaliatory attack in response to Israel destroying the terrorist group’s attack tunnel that crossed from Gaza into Israel last month. Maj. Gen. Yoav Mordechai, who runs the Defense Ministry’s chief liaison office with the Palestinians, recorded a YouTube video in which he addressed the terror group’s leaders in Syria, warning that Israel knew of their plans and was prepared to respond to them. The Palestinian Islamic Jihad responded by describing the video warning as “threats” and “a declaration of war”, saying it had the “right to respond to the crime of aggression on the resistance tunnel”. A BBC producer working in Israel also described the Israeli warning as a ‘threat’ on Twitter. As the same BBC employee is aware, on November 13th the IDF arrested a senior PIJ operative in a village near Jenin. “The Shin Bet security service confirmed that Tariq Qa’adan was picked up by the Israel Defense Forces in Arrabeh, southwest of Jenin, in the northern West Bank. On November 14th it was announced that the Iron Dome missile defence system had been deployed in central Israel. 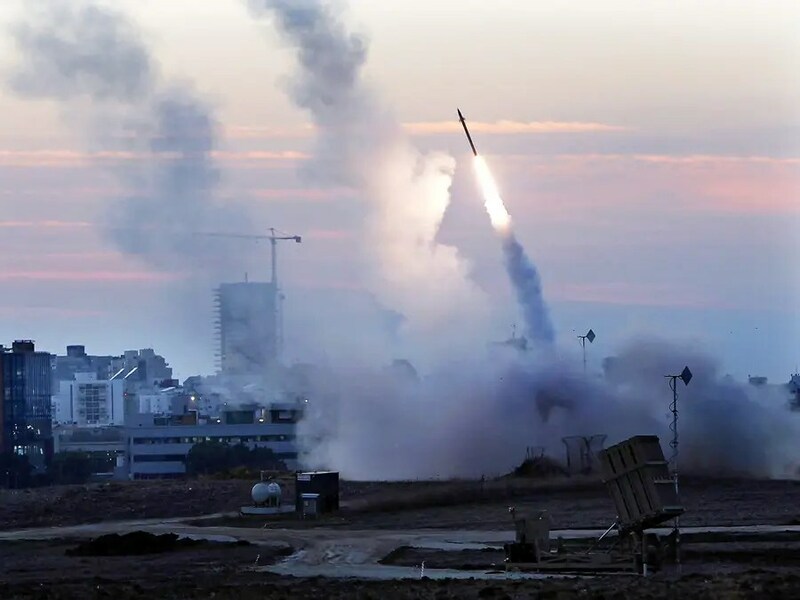 “An Iron Dome missile defense battery was deployed in the Dan region — made up of Tel Aviv and the surrounding suburbs — it was revealed on Tuesday, a day after the military said it had stationed several interceptors in central Israel to protect against a possible rocket attack. The battery is one of several measures taken by the army to raise its alert level and response capabilities amid heightened tensions with the Palestinian Islamic Jihad organization since the army demolished the terrorist group’s border-crossing attack tunnel last month. As has so often been the case in the past, should the situation escalate and Israel be forced to respond to an attack by the PIJ terror group, the BBC’s audiences will lack the background information necessary for understanding of the context to any such action. 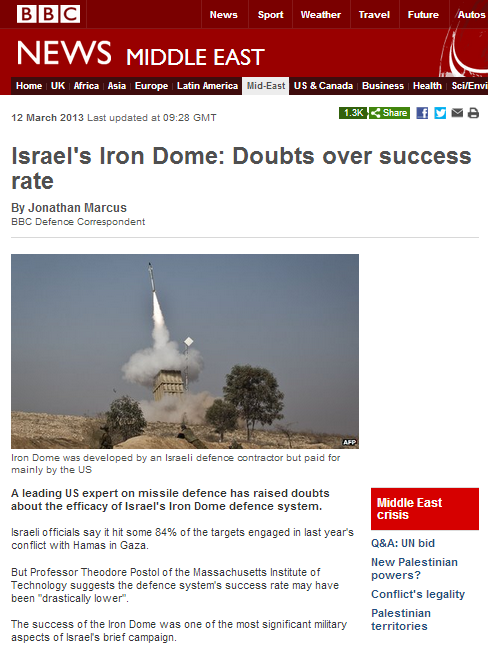 Back in March 2013, the BBC’s defence correspondent Jonathan Marcus wrote an article entitled “Israel’s Iron Dome: Doubts over success rate” which appeared on the Middle East page of the BBC News website. “A leading US expert on missile defence has raised doubts about the efficacy of Israel’s Iron Dome defence system. Israeli officials say it hit some 84% of the targets engaged in last year’s conflict with Hamas in Gaza. Mr Marcus took great exception at the time to our critique of the claims made by his source. 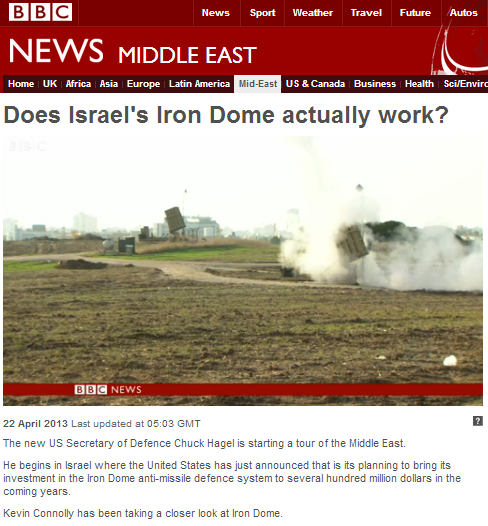 Six weeks later, the BBC News website published filmed and written reports by Kevin Connolly on the same subject, asking “Does Israel’s Iron Dome actually work?”. “… the threat that missile defence is now ranged against is very different. It is not – despite Russian protests – aimed at weakening Russia’s nuclear forces. It is designed to protect against a very specific threat – from Iran or North Korea’s developing missile arsenals. Against this kind of threat, the requirement is not simply to alter an adversary’s strategic calculations, but to stop each and every missile getting through. Readers may recall that soon after the commencement of Operation Protective Edge the BBC’s diplomatic correspondent saw fit to recycle a link to an article he had written in 2013 questioning the performance rate of the Iron Dome missile defence system on the basis of publications by MIT professor Ted Postol. The same claims were also the basis for two additional reports by the BBC’s Kevin Connolly in April 2013. The Begin-Sadat Centre for Strategic Studies at Bar Ilan University recently published a paper by Uzi Rubin in which he examines Israel’s air and missile defence during Operation Protective Edge. Dr Rubin’s very interesting report can be found here in both English and Hebrew. Six weeks after the appearance of Marcus’ report – in April 2013 – the BBC Jerusalem Bureau’s Kevin Connolly produced two additional reports on the same topic promoting the same claims advanced by Postol. Well now it appears that Jonathan Marcus’ “highly respected scientist” has found a new outlet via which to promote his theories. Towards the end of August 2014 Ted Postol gave two interviews to a person named Ryan Dawson who uploaded them to his Youtube channel which is titled ANC Report – “Anti-neocon Report”. In the first of those interviews Postol again promotes his claims regarding the Iron Dome (as well as his opinions on Israel in general and American domestic politics) and in the second he takes issue (as he has before) with the fact that the Syrian regime used chemical weapons against civilians in Damascus in August 2013. Both interviews provide very revealing insight into Postol’s political views – and his motivations. So who is the person with whom this “highly respected scientist” agreed to chat in such a chummy manner for an hour and a half? Adam Holland has more details on Ryan – or Ry – Dawson. Perhaps Jonathan Marcus would be kind enough to tell us in the comments below whether he thinks it appropriate for the BBC to still be promoting on its website the bizarre claims of someone who collaborates with a known antisemitic Holocaust denier? 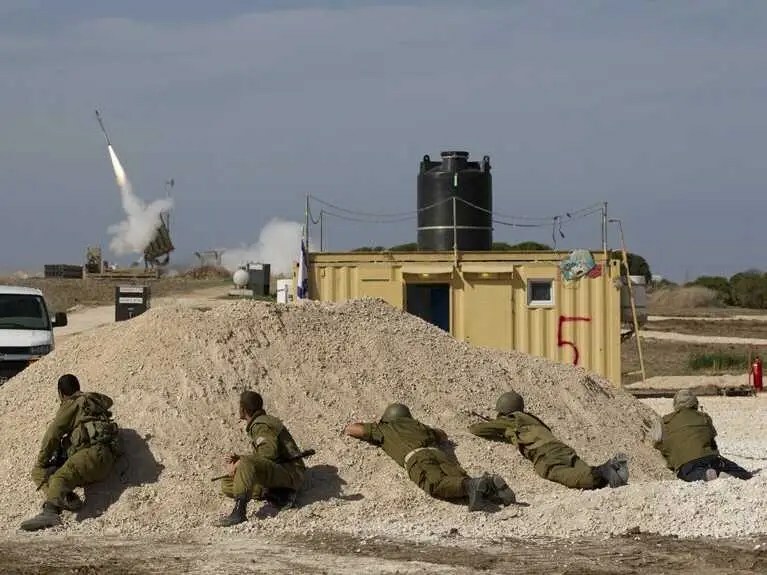 In the weeks which preceded Operation Protective Edge attacks from the Gaza Strip escalated with 52 missiles fired during June 2014 and 237 missiles and dozens of mortars fired in the first week of July – eighty of them on July 7th alone. Since the commencement of the operation on July 8th 2014, terrorist organisations in the Gaza Strip have fired over 3,500 missiles of various types at Israeli civilian targets. The Iron Dome missile defence system, which only targets projectiles analysed as set to land in populated areas, intercepted some 600 of those missiles at a 90% success rate. Missiles which evaded the Iron Dome and mortars (which the system is not designed to target, although it has had some success in that field too) account for around a hundred missile hits in Israeli civilian communities since July 8th. In the first week of the operation alone, 417 buildings and 228 vehicles were damaged by missiles. 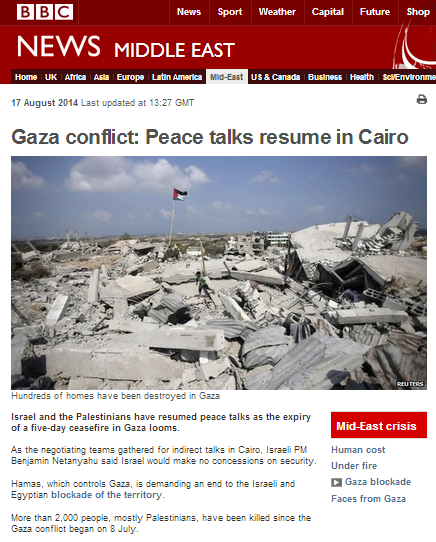 So how did the BBC News website present those facts (all readily available in the public domain) to audiences in its August 17th article titled “Gaza conflict: Peace talks resume in Cairo“? Remarkably, according to the BBC’s account, missiles fired from the Gaza Strip do not seem to land anywhere. The actual number of missiles fired is severely under-reported and presented in vague language even though the precise statistics are available. The consequences of those missiles are presented exclusively in terms of Israelis running for cover with no mention of what happens when they land and the fact that around a hundred of them have hit populated areas with destructive results to buildings, infrastructure, property and people. Whilst the Iron Dome system has indeed intercepted “many missiles” thus preventing much more loss of life, injury and damage, that does not – as the BBC’s wording implies – mitigate the effect of those missiles as weapons intended to terrorise Israel’s civilian population and paralyse normal life. 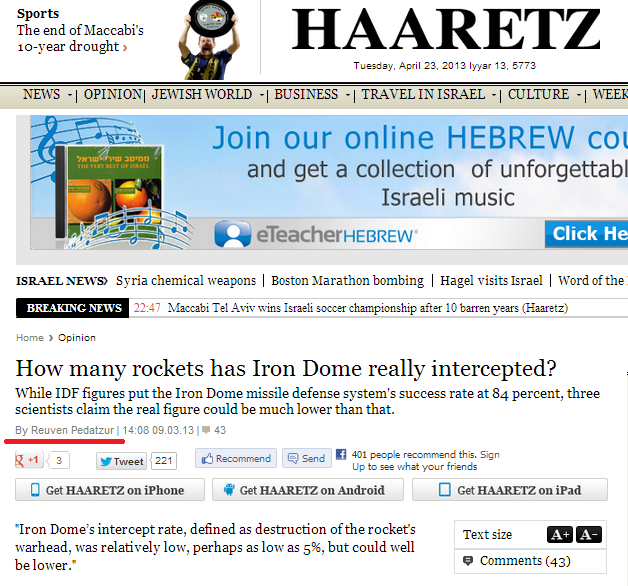 In the paragraph prior to that one, however, readers discovered that in contrast, Israeli weapons do hit the ground. No less interesting is the choice of wording used with regard to casualties: whilst Israelis “have died” – phrasing which does not imply cause – Palestinians are killed – a term which does indicate an outside cause of loss of life. “Most of the more than 1,900 Palestinians killed are civilians, according to the United Nations. Later on, the report presents a different account of the cause of the conflict but with no information given concerning the efforts made by Israel to avoid the hostilities, meaning that audiences are left with no clear understanding of which party initiated them. Likewise, Hamas involvement in the kidnapping and murder of three Israeli civilians is still being airbrushed from the BBC’s version of events. As has been the case throughout BBC coverage of the conflict, the dissolving of the Hamas government in Gaza after the establishment of the Palestinian unity government at the beginning of June and the resulting Palestinian Authority responsibility for attacks emanating from the Gaza Strip is ignored. In that sentence in the body of the article and separately both in a sidebar of related articles and a similar extended menu at its foot, three links are provided to the inaccurate and inadequate backgrounder on the topic of border restrictions which the BBC produced on August 13th. “Israel occupied Gaza in 1967 and pulled its troops and settlers out in 2005. Once again, no effort is made by the BBC to explain to audiences that Israeli control of the Gaza Strip’s coastal waters and airspace is in fact part of the Interim Agreement signed by the representatives of the Palestinian people, rather than some Israeli caprice. Likewise, the BBC has made no attempt whatsoever to clarify to audiences that according to the terms of existing agreements between Israel and the PA, there should be no paramilitary groups in the Gaza Strip. That information is vital if audiences are to understand why the terms presented by Israel in ceasefire discussions include the demilitarization of the Gaza Strip and why it will not agree to lift the naval blockade and border restrictions for as long as Hamas and other terrorist organisations continue their efforts to import prohibited weapons into the territory. To date the BBC has failed to provide its audiences with that crucial context meaning that they are unable to build an accurate understanding of an international issue to which the BBC has devoted thousands of words. 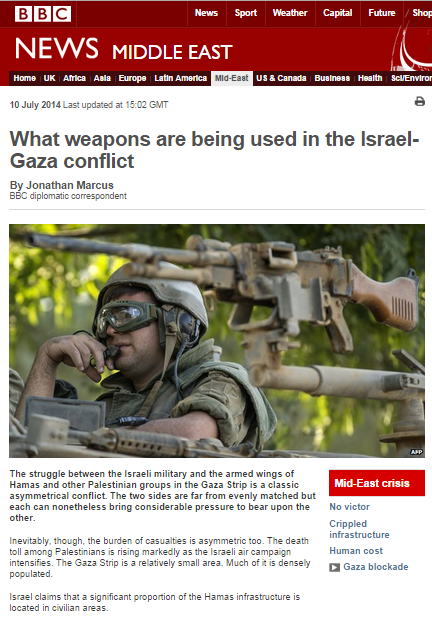 Remember the BBC’s 2013 Iron Dome story? Readers may remember that around this time last year the BBC News website published items by Jonathan Marcus and Kevin Connolly which suggested to audiences that Israel’s Iron Dome missile defence system might not actually work. Jonathan Marcus’ article titled “Israel’s Iron Dome: Doubts over success rate” appeared on March 12th 2013 and that was followed on April 22nd by two items from Kevin Connolly: a filmed report also shown on BBC television news programmes and a written article. Recently however, the US embassy in Tel Aviv’s chief defence attaché put forward an interesting proposal. “A U.S. general proposed on Monday that Israel upgrade its anti-missile systems to include neighboring Jordan and possibly Egypt, and an Israeli official cautiously welcomed the idea. The two Arab countries that have full peace treaties with the Jewish state share some of its concern regarding the disputed nuclear program of Iran and the civil war wracking Syria – both states with long-range missile arsenals. Jordan’s Red Sea port of Aqaba is also under threat from short-range rockets fired by Islamist militants in the largely lawless Egyptian Sinai – though they have more regularly targeted the next-door Israeli resort of Eilat. Brigadier-General John Shapland, chief defense attache for the U.S. Embassy in Tel Aviv, raised the idea of extending Israel’s anti-missile umbrella in comments to a security conference in the city. Oh dear. It seems as though Brigadier-General Shapland has not been keeping up to speed with the BBC News website’s revelations. Six weeks after the BBC’s Defence Correspondent Jonathan Marcus based an entire article on speculations raised in an opinion piece written by Reuven Pedatzur in Ha’aretz, we now have two more BBC reports on the subject of the Iron Dome – this time by the Jerusalem Bureau’s Kevin Connolly. Both those reports – a filmed version entitled “Does Israel’s Iron Dome actually work?” which also appeared on BBC television news, and a written version titled “Doubts fail to dent confidence in Israel’s Iron Dome” – appeared on the BBC News website’s Middle East page on April 22nd. Neither of the reports, however, brings anything new to the subject. Like Marcus’ previous piece, they too are based on the same speculations by the same people. In both items Connolly interviews the man who wrote the original Ha’aretz article. Accurately put, those missiles were not fired at the Iron Dome or at Israel (depending on how one wishes to interpret Connolly’s English), but at civilian communities within Israel. And as BBC Watch pointed out in relation to Jonathan Marcus’ article, Israeli and American scientists work on this project together, thus Connolly’s insinuation that the Iron Dome’s success rate is exclusively an Israeli claim is inaccurate. That turn of phrase sails dangerously close to the kind of antisemitic winds which whisper of “Jewish power” and Connolly should know better than to play to the bigots’ gallery in this fashion. “It is perhaps not a coincidence that on the eve of his visit, it emerged that the US is preparing to increase its investment in Iron Dome, the missile defence system said by Israel to have shot down nearly 90% of the rockets fired at it from Gaza last November. “The United States Department of Defense and Israel’s Ministry of Defense are continually working together to ensure their militaries have the necessary capabilities in place to deal with changing security environments. These include major advances in cooperative rocket and missile defense efforts between the United States and Israel including Iron Dome, Arrow and David Sling. So according to the man who, it is safe to assume, knows rather more about this than Kevin Connolly, “preparing to increase its investment” is actually “requesting” and “$790m” is actually $680 million. And if Mr Hagel does not appear to be as “troubled” by the kind of evidence-free speculations tossed around by that “handful of sceptics” as Connolly appears to think he should be, that is probably because he has access to information to which neither Connolly nor the Ha’aretz writer are privy. Connolly then goes on to quote two men who dismiss Pedatzur’s allegations – Uzi Rubin and Amos Harel. Connolly brings no new information to his audiences in either of these reports. Except for a near-antisemitic smear in his written piece and a snide dig at Israelis in the filmed report, he achieves little apart from padding out the BBC website. So what exactly is the point of the BBC’s repeated publication of articles on this subject which are based on nothing more than uninformed speculation? That remains unfathomed, but certainly the BBC would enhance its credibility were it to review its apparent policy of relying upon Ha’aretz as a source. 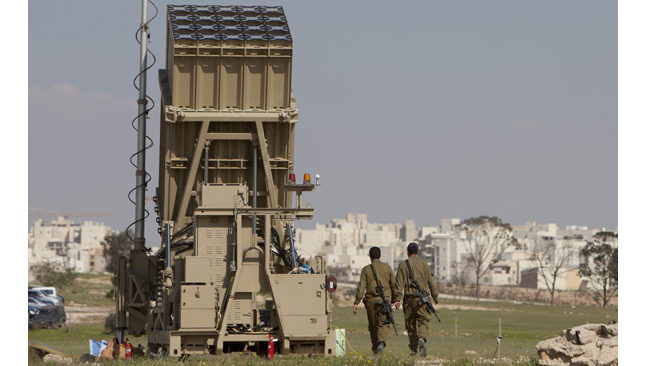 A few weeks ago we addressed on these pages the subject of an article by the BBC’s Defence Correspondent Jonathan Marcus concerning claims regarding the success rate of the Iron Dome made by MIT professor Ted Postol. “I really do think this is very poor “journalism” on your part. Mr Silverstein has nothing to do with our story and presumably you include his name to excite/incite your readers. The report on Ted Postol’s work (with two other scientists cited) first ran in Ha’aretz. I saw this but waited until I had a chance to speak to Postol – who despite your rather nasty insinuations, is a highly respected scientist with a distinguished track record in this field. You will remember that he correctly questioned the performance of the initial Patriot system in the war to liberate Kuwait. His concerns about Iron Dome certainly merits an airing rather than criticism. The BBC did eventually get a response from the Israeli MoD and I updated my piece to carry this. The original story carried a blander response from them. I fear you see plots to do down Israel where they don’t exist. I am told by technical experts that there probably are ways Israel could provide data to prove the success of its system – if indeed it was succesful – without damaging national security. Let the IDF/MoD back up their claims. It is costing rather a lot of US money, which is no problem if it works, but may be a problem if it does not. 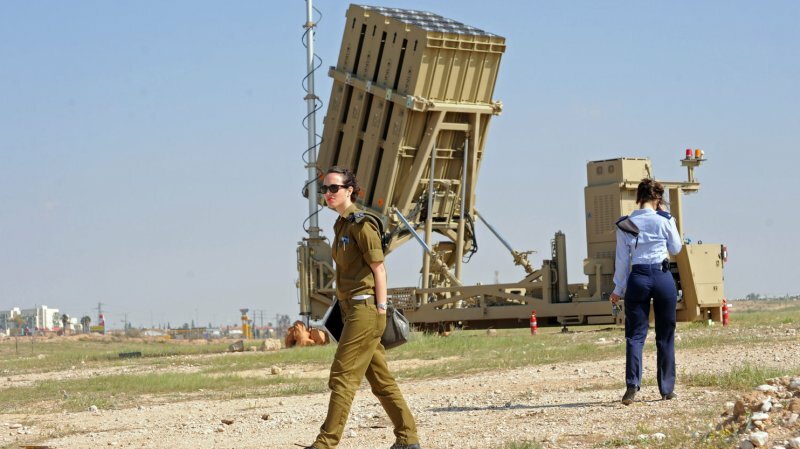 A recent article from the Jerusalem Post – written by the former Director of the Israel Missile Defence Organisation, Mr Uzi Rubin – may be of interest to readers. “Postol’s “analysis” of these public video clips and his underestimation of the Iron Dome’s effectiveness are meaningless and his conclusions are completely baseless. In those clips, only the Iron Dome’s trail of smoke can be seen. The Grad rocket that it is about to intercept, however, cannot be seen. On March 8th, Richard Silverstein – a man who rarely comes across an Israel-related conspiracy theory he does not like – published an article on his blog claiming that the success rate reported for the Iron Dome defence system during Operation Pillar of Cloud was much lower than previously thought. Silverstein based his article (also reproduced by the Eurasia Review on the same date) on an opinion piece which appeared in Ha’aretz in both English and Hebrew – curiously dated March 9th. On March 11th the same story was taken up by the notorious Hamas-supporting, anti-Israel outfit and go-to place for anyone who fancies a Raed Salah calendar, Middle East Monitor (MEMO). The next day, March 12th 2013, that ‘illustrious’ band was joined by the BBC when Defence Correspondent Jonathan Marcus produced an article entitled “Israel’s Iron Dome: Doubts over success rate” which appeared on the Middle East page of the BBC News website. All of the above articles, including the one by Marcus, are based on the opinions of MIT professor Theodore (Ted) Postol who has made something of a name for himself over the years through his criticism of various missile defence systems. Interestingly, Postol’s opinion of the Iron Dome seemed to change dramatically almost overnight, with him giving it a glowing review in the MIT Technology Review on November 26th 2012, but expressing the opposite view only three days later in another interview. Perhaps in Massachusetts, missile shrapnel only hits one building or vehicle at a time. “The BBC tried to contact Rafael, Iron Dome’s manufacturer for a response to Mr Postol’s claims but was unable to get a reply. The Iron Dome project is of course a team effort, with the manufacturer Rafael producing the system and the Israeli Air Force operating it. The project is coordinated by the Ministry of Defence , which the BBC could have approached for comment and information – but did not. BBC Watch, however, did speak to the Ministry of Defence and was told that not only does the 84% success rate stand, but that post-event analysis by the Israel Missile Defence Association and the American Missile Defence Agency – carried out by scientists with access to the full range of data, of course – suggests an even higher success rate. It is a pity to see the BBC’s Defence Correspondent jumping onto the same sensationalist bandwagon as discredited propagandists such as MEMO and Richard Silverstein without a thorough check of a story’s accuracy, credibility and relevance.